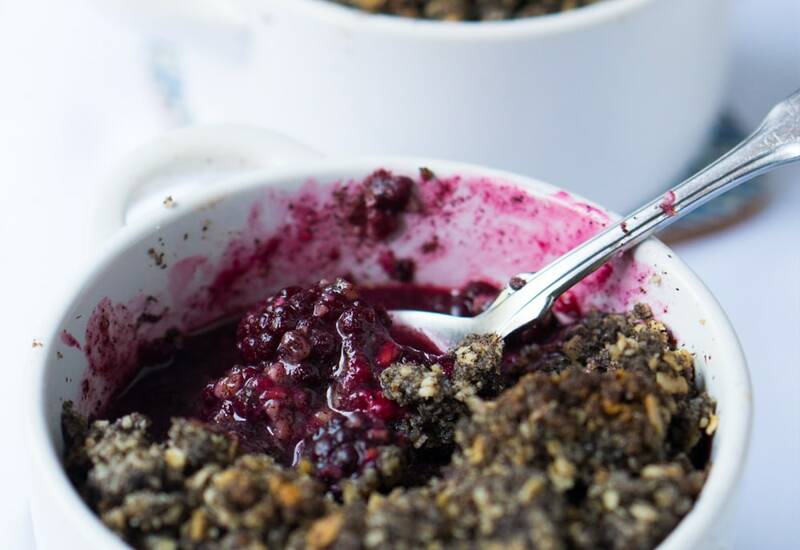 This berry crumble is the answer to your gluten-free, vegan dessert prayers. This recipe calls for buckwheat flour, which is naturally gluten free. (Buckwheat is actually a seed, not a grain.) It has a nutty, earthy flavor that goes beautifully with tangy and sweet berries. You can use any berries you like—strawberries, blueberries, raspberries, or blackberries. Just make sure they're fully ripe so they burst with flavor in the finished dish. The crumble is delicious served warm with vegan ice cream for dessert. It also makes a terrific breakfast. Hazelnuts really complement buckwheat, but feel free to substitute ground almonds, if you prefer. Oats are gluten free but they are often processed in a facility with wheat products. Make sure your package of oats specifies that it's gluten free. Per Serving: 301 calories; 16g fat; 38.1g carbohydrates; 4g protein; 0mg cholesterol; 4mg sodium. You had me at hazelnut meal, I have to admit. Buckwheat is an acquired taste, but luckily one I adore, and so should you! I love using chilled coconut oil instead of butter -- very cool! I'm used to apple crumble, but this berry version with buckwheat is phenomenal. Instead of agave nectar, I used real honey, and it was perfectly sweet. This dish had delicious topping and lots of flavor. I'm so impressed with the way it turned out.